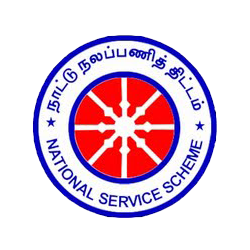 The objective of NSS is to render service to the community while undergoing education in an institution. It seeks to arouse the social consciousness of students and provide them with opportunity to work with the people around educational campuses creatively and constructively and to put the education they receive to concrete social use. Its motto is ‘NOT ME BUT YOU’. The college has Eight units with students of the degree classes enrolled as volunteers. Prize: Thazhakudi Bhagavathì Perumal Pillai – Thanammal Prize, instituted by Dr. B. Nagalingam Pillai for the best N.S.S Volunteer.